After its Winterpause hiatus the Bundesliga returned to action Friday night. The defending champions faced a difficult trip to Sinsheim as Hoffenheim vs Bayern kick-started the Rückrunde. An old analogy, but one that bests fits tonight’s action. Bayern were simply unplayable during the first half and the Bavarians should have gone in at the break with more than a two-nil lead. Niko Kovac’s side cut through their hosts with ease, the starting shape chosen by Julian Nagelsmann afforded too much space to Bayern which they used to excellent effect. Kinglsey Coman’s speed down the left flank was matched by David Alaba’s pinpoint precision balls from the opposite side. Bayern’s work ethic across the field was unmatched by Hoffenheim – the Sinsheim side looked as rusty as a team emerging out of a winter-break possibly could. Nagelsmann knew he needed to act during the half-time pause and the soon to depart Hoffenheim head coach made his move. In a scene similar to one witnessed throughout the season, a tweak to the speed in play allowed the hosts to put Bayern under immense pressure. In the 56th minute a double substitution led to a formation change, which in turn breathed new life into die Kraichgauer. It wasn’t long before their two goal deficit became one, and Bayern looked decidedly edgy each time an attack was mounted. 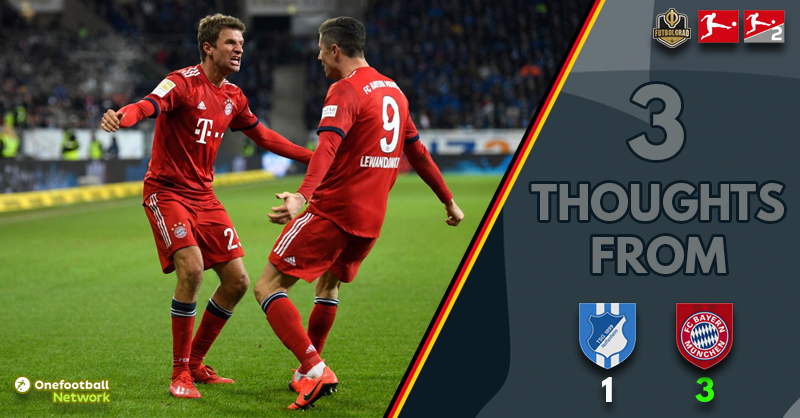 In pursuit of an equaliser vast open spaces were once again exploited by Bayern, and when Robert Lewandowski fired in the champion’s third goal it summed up Hoffenheim’s night – this game was lost in the first half. Their five game winning streak which concluded the Hinrunde had propelled the stuttering Bavarians back into second place. It looked like the mid-season break came just at the wrong time – however, they quickly slipped back into dominant ways inside the newly named ProZero Arena. The speed at which Bayern punished Hoffenheim this evening showed that for all their early season problems, the Rekordmeister are not quite ready to hand their crown over to Dortmund without a fight. It was our goal to win this game. We know we have a lot of quality in the team but the first half was great, we can be proud of that first half performance, but we the game is 90 minutes long and you can see we still had work to do. 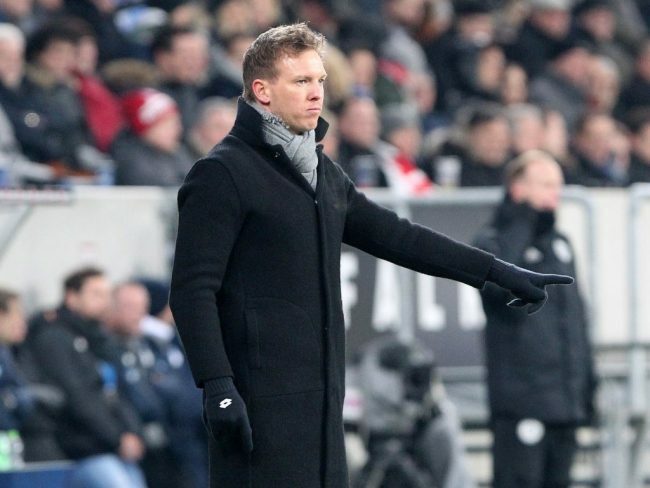 Hoffenheim vs Bayern : Julian Nagelsmann – Tactical excellence or poor foresight? There is no doubt that the Hoffenheim coach is an exceptional tactician, his implementation of big screen technology inside TSG’s training complex shows that the 31-year-old is at the forefront of thinking outside the box. He displayed once again this evening why he was first choice for RB Leipzig next season. Against Bayern München he proved that when the game looked beyond his side, he was able to counter the problems – causing a dominant opponent to rock backwards. However, this is becoming a regular trait – rescuing games, pulling Hoffenheim back into contention when they have allowed their opponent to take the lead – and the advantage. If Nagelsmann’s ‘plan B’ produces a better performance than his plan A, there could an argument that instead of rescuing fixtures Hoffenheim could actually dominate them.